Georgia Simmerling helped Canada capture a silver medal in a World Cup women's team pursuit as she returned to track cycling after a serious injury. The 29-year-old West Vancouver native, who broke both her legs last January at a World Cup ski cross event, teamed with Allison Beveridge of Calgary, Ariane Bonhomme of Gatineau, Que., and Annie Foreman-Mackey of Kingston, Ont., to take silver behind host New Zealand on Friday. New Zealand won the final by 1.242 seconds over Canada. Italy took bronze. 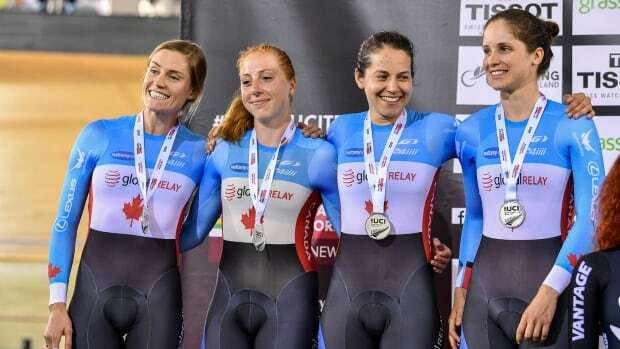 "While we weren't quite able to top the Kiwis in the final, I'm extremely pleased with the team's performances today," said Craig Griffin, women's track endurance coach, "Everyone has worked really hard in the last few months and it's beginning to pay dividends." Canada's time of four minutes, 15.179 seconds in the first round was less than one second off the national record set at the 2016 Rio Olympics. The Canadian men's pursuit team also won silver. Aidan Caves of Vancouver, Derek Gee of Ottawa, Adam Jamieson of Barrie, Ont., and Jay Lamoureux of Victoria, B.C., finished second behind New Zealand. Switzerland captured bronze. Vincent de Haitre of Cumberland, Ont., who recently transitioned to track cycling from speedskating, also raced for Canada in the first round of qualifying when the team set a national record for the fourth time this season with a time of 3:52.420. "Today was a big step forward for the men's team pursuit program," said Jono Hailstone, men's track endurance coach. "The boys continued their steady progression and showed that they are becoming genuine contenders on the world stage." Meanwhile, Canada's women's Madison team suffered a blow in training when Steph Roorda crashed, breaking her collarbone. Designated alternate Kinley Gibson will step in to join Allison Beveridge for the competition on Sunday.